Most clients getting tattooed by Jay Freestyle have no idea what piece they’ll be wearing when their session with him is over. As his name alludes, “freestyle” is the best way to describe how he does his work. Ninety percent of his tattoos are created on the spot – the moment the needle touches the skin. According to Freestyle, his artistic abilities were evident at a very young age. When he decided to pursue his dream of becoming a tattoo artist, his family did not offer him a great deal of support. Eventually, he left his home in South Africa and moved to Amsterdam, where he currently works out of Dermadonna Custom Tattoos. Read more and find out why so many clients have entrusted their bodies to Jay to use as his “freestyle” canvas. Did you come from a creative background? No, I was the only one in the family with any interest in art. My mother did, however, see that from a young age I could draw and thus encouraged me to nurture my talent. I wasn’t that into my art back then as I am now, it was just a fun hobby. How old were you when you began your career as a tattoo artist? How would you best describe your style (or, what sets you apart from other artists)? My tattoos are very graphic and abstract, produced in a painterly manner. The thing I like most about my style is it can’t really be categorized because I’ll always be evolving as an artist, so the style will always be changing. I normally try to achieve the effect of a piece of art that was painted onto the body rather than it looking like a tattoo. When people see my work I want them to think, “wow I’ve never seen anything like that before”. Even if they don’t understand it, they still appreciate the tattoo as a piece of art rather than a tattoo. The thing that sets my work apart from others is maybe the spontaneity. I create my works on the spot and make it up as I go, so my work is not easily duplicated. The size of my pieces is also what sets me apart. I focus on large-scale tattoos because they hold so much more power. What do you love the most about the tattoo lifestyle? What’s not to like about it? I guess one of my favorite things is the travel and being able to take my work with me. 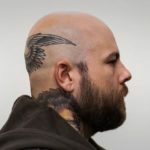 What are some of the differences between the tattoo scene in America compared to Amsterdam/other places in the world? Every country has a different culture and mentality, which makes for interesting variation in what people want to get done. The tattoo scene in the US is really big compared to Amsterdam; we’re still very small compared to some of the other European countries. In Amsterdam, people are more afraid to commit to large-scale tattoos. Their ideas are also a lot simpler and less creative. Americans I’ve found tend to want more unique individual tattoos and come up with crazy ideas sometimes. They often want large tattoos or are not afraid to go big. They’re less conservative in that manner. Are there any particular people/things/places that have influenced you? Everyone and every place I visit influenced me in some way. Exploring different cultures opens my mind more and more each time to different ways of thinking and perceiving everyday life. Meeting other artists, of course, influences my art by sharing our knowledge with each other. I’ve met many people who have influenced the way I look at life and my personal lifestyle. Others have influenced my artwork and career. I’m grateful to everyone who has been with me so far through my journey. What are some of the challenges you’ve faced as a tattoo artist? Gaining my parents approval and support was one of the most difficult challenges, they never believed in me as a tattoo artist and wanted me to stay in the family business. You mix and match many different mediums into your tattoos. Are there any combinations you prefer to use more than others? It comes down to the subject matter of the tattoo. I enjoy doing faces with some kind of abstract element to it. I like the combination of realistic with abstract. I hate doing line work, so I try to avoid too many lines in the piece. Does your art reflect the personalities of your clients as well as your own? One could say that. Every collector is different so their wishes of what they want to get done are obviously going to have an effect on the piece. 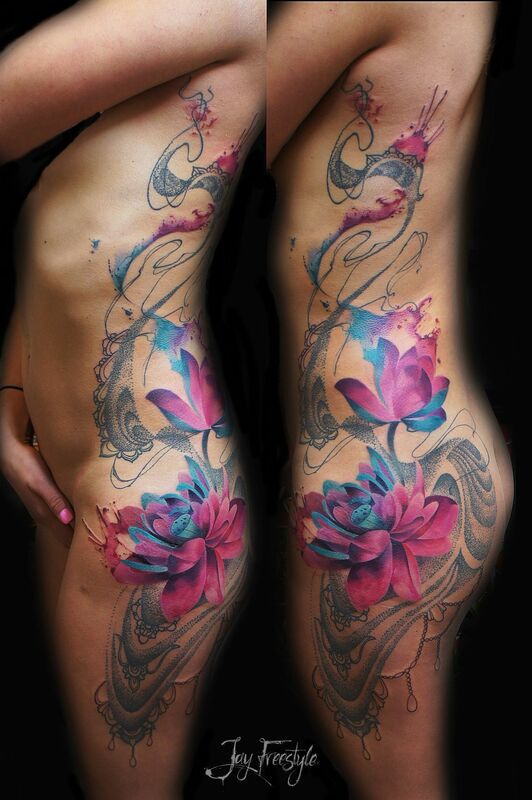 The subject matter is the main factor showing through in the tattoo what their personality is like. My style is just what represents that, but I wouldn’t say my personality is reflected in my art. My personality is quite the opposite of what my art shows. Of all the tattoos you’ve created, do you have any favorites? Yes, one of them is on my friend’s leg, it’s a tree turning into a woman. Another piece I love is the giant bull skull/dreamcatcher full frontal piece. I love that one because it’s very rare to see a woman with such a large full frontal piece. That’s getting hard to decide, every time I go somewhere new I think that that’s my new go-to spot. It used to be the U.S but now it’s a toss-up between Canada and Australia. Any place you haven’t been to that you’d like to visit? Outside of art and tattooing, what else are you passionate about? Living life to the fullest and seeing as much of the world as I can.